The Macon Public Library & Historical Society, which was chartered in 1876, commissioned D. B. Woodruff to design the city’s first library, completed in 1889 in the Romanesque Revival style. The library (located here until the 1920s) was on the second floor while commercial businesses occupied the first floor. It housed numerous other tenants over the years. [David B. Woodruff was a Connecticut native who came to Georgia in 1853 and served with the Macon Volunteers (Infantry) in the Civil War. He designed several important buildings in Macon and Augusta]. In the 1960s, the building was home to the College Discotheque, a popular hangout and music venue. 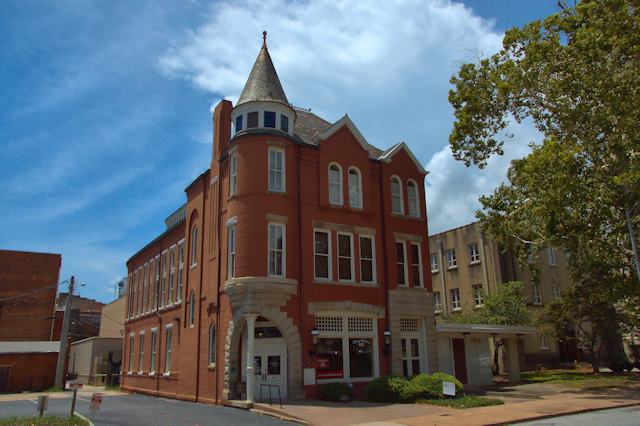 On 2 May 1969, the Allman Brothers Band played their first gig in Macon here. They had recently moved to town to be near Phil Walden and Capricorn Records. After falling into disrepair and facing demolition in the late 20th century, the old library was completely restored by Tony Widner around 2007. It’s now known as the Library Ballroom and serves as an event venue.